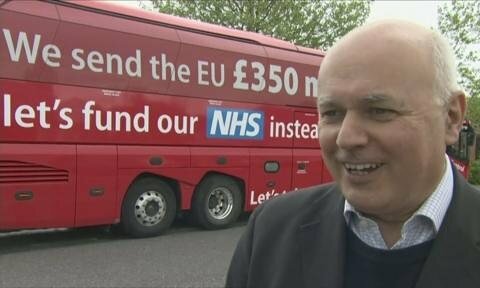 The unfortunate coincidence of this bus popping up out of nowhere behind Iain Duncan Smith has led people to question his honesty. In establishing in my own mind – and sharing here – that the arguments to leave the EU didn’t stack up, I hadn’t really considered what the next steps might be if Brexit won the day. Neither, incredibly, did the people who would have to take those steps. People on both sides of the debate are beginning to come terms with that. We know that the terms ( . . . ) would need to be negotiated with ( . . . ) the EU. An honest assessment of the challenges and uncertainties of leaving ( . . . ) would have seriously helped the debate. The above quote does not come from this week, but from then Scottish Secretary Alistair Carmichael in November 20136 after the publishing of the SNP’s White Paper ahead of the Scottish Independence referendum the following year. That White Paper was 670 pages long and made public nine months ahead of the referendum and so – regardless of whether it was indeed a “wish with no price list” – it is still indisputably better than anything Vote Leave (or anybody else) produced, which amounted to little more than a few bold – and, as it turns out, misleading – statements about immigration, spending and ‘taking back control’. It is perhaps hardly surprising then that the government – who would always be responsible for taking Brexit forward – appear to be having difficulty establishing the relativity of their arse and elbow. Of course, this may not be the shambles it appears; it has been suggested7 that David Cameron never had any intention of following through and that he is quite happy for his successor to take – or not – that fateful step. Nevertheless, by accident or design, the country is in limbo with a headless chicken feel about it. All of this was somewhat predictable. In fact, Nick Clegg did predict it with unerring accuracy8. This uncertainty has created a void which is currently being exploited by those with a sinister agenda. It’s often asserted that history is told by the victor and this result has handed a megaphone to those on the far right. Nigel Farage could be found all over the airwaves on Friday morning crowing about ‘Independence Day’. It is unclear what he thinks we have gained independence from. We have elected our government for many years (albeit using a fundamentally flawed system – more of that later), and our Parliament makes our laws. That will not change. It would appear also, if and when Brexit does happen, we will still be able to access the single market, which is good, right? There’s just one condition – freedom of movement. So the most notable thing that we have freed ourselves from is the ability to influence the EU rules that we will still, it seems, have to abide by. Of course, it may be that we can strike up a better deal but, as nobody has really considered it – or probably will until a new Prime Minister is chosen – it’s impossible to know at the moment. So, more uncertainty then. On the subject of our new Prime Minister, isn’t it good to have taken back control? The Conservative Party will now make that choice for us. Our control, as a populace, is somewhat limited and not really related to EU membership. We get an opportunity every 5 years (watch this space on that one) to choose the person who represents us in Parliament. Through that, we can have a small influence on who forms the government. The reality, however, is that many are locked out even of that choice. Our First Past The Post system ensures that millions of votes are meaningless. Perhaps this explains the number of people stating that they voted Leave without really thinking the Brexiters would win. People simply aren’t used to voting in a system in which their vote actually counts. I’m sure that there will be people on both sides of the argument, and in any election, who regret the way they vote, but the anecdotal evidence of Leave voters thinking again has been enough to give the phenomenon its own stupid name; Bregret9. Bregret has caused some to suggest that Leave voters were – how can I put this politely? – a little naive. Some clearly were but it is both unfair and counterproductive to throw the accusation of stupidity at 17,410,742 people. However, the Leave campaign was as guilty as anyone of portraying the vote as the educated against the uneducated – Michael Gove, in particular, showed the sort of anti-intellectualism that has been a theme of his time in government with his derision of “experts”10. Everybody’s view is valid, be they expert or novice (this blog relies on such sentiment) but why be so dismissive of the views of those who make a living from studying the subject that they are offering views on? It was a very deliberate part of the ‘people versus the establishment’ tactic. Farage, of course, by implication believes that those who voted Remain are neither ordinary nor decent. I’ve got this far without even mentioning Scotland. In Scotland, we voted to remain by 62% to 38%. That came as no surprise. Nor was it a shock to hear talk of a second referendum on independence mooted as it became clear that the UK had voted to leave the EU. This very scenario was the example that Nicola Sturgeon gave of a “material” change in circumstances that could spark IndyRef2 (as it is annoyingly referred to)11, and at the time she made that suggestion it seemed entirely reasonable to me. It still does. There may yet be a way for Scotland to remain in the EU without independence through a so-called ‘reverse Greenland’ arrangement.12. A second referendum so close to the first would run the risk of a repeat no vote. Even with a number of very firm No voters in 2014 telling me that they would vote Yes if given the opportunity now, there is still a 10% swing required and there will, of course, be some Yessers who would now vote No. My guess is that the viability of the Greenland model would depend very much on the negotiations that the UK has with the EU – if it ever gets that far – and which aspects of our governance are devolved. The situation in Northern Ireland (who also voted Remain) seems even more precarious, with the Good Friday Agreement apparently at risk.13 The significance of the Brexit vote could be even greater for the future of the British Union than the European one. There is still the very real possibility that Brexit won’t actually happen.14 The referendum was advisory, the margin of victory was slim (so slim that Farage would have been clamouring for a second referendum had it been reversed15) and Parliament must take the next step, with most MP’s having backed Remain in the firm belief that to leave the EU would be disastrous. Just as our MP’s consistently rule out a return to capital punishment – almost certainly against the will of the majority of the population – I very much hope that they save us from ourselves on this occasion. Whatever Parliament does, we need our leaders to get a grip of the situation and put the head back on the chicken. Immigrants are welcome in my country; in England, the country of my birth, and in Scotland, my country of residence. Immigrants are welcome in my community. I am an ordinary, decent person. Ordinary, decent people do not worry too much about which particular section of the earth’s surface their neighbour hails from. Good article! Sadly this was all so predictable – not least what we know now i.e. that ‘they’ (the politicians) were all playing games with each other, and us, rather than thinking about what we all need and want as a united and tolerant country moving forward through the 21st century.